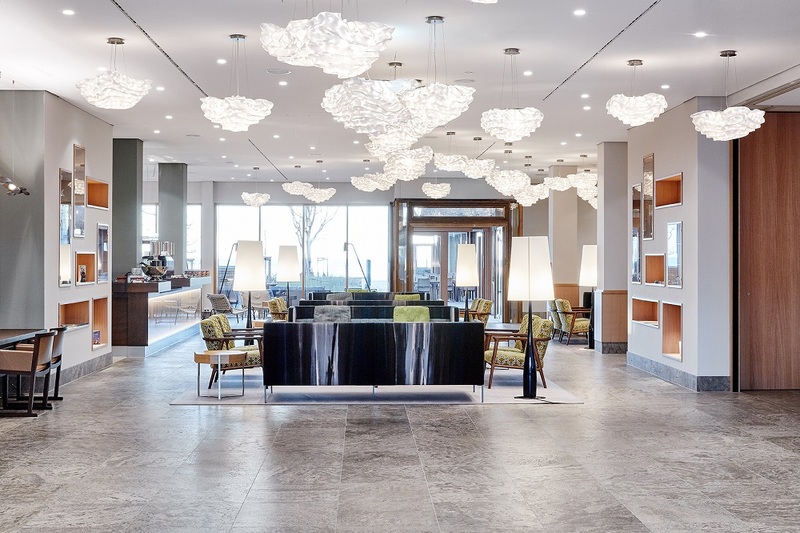 Upstalsboom Wellness Resort Südstrand - Relax in the "Frisian Caribbean"
The new Upstalsboom Wellness Resort Südstrand opened in Wyk on the island Föhr in October 2018. The 4-star superior hotel invites you to relax and unwind - not only because of its direct beach location with its unique views of the North Sea but also because of the luxurious, natural materials used in the hotel's interior. KMD was responsible for the complete natural stone and tiling works in the 144 rooms and 23 exclusive residences. Bronze Gray with a satin finish was used for the vanity tops, walls and plinths, as well as Spanish tiles and Sicis mosaics. The residences are also equipped with pantry kitchens with Silestone worktops. The spacious, public area was also realized by KMD. Here we used Mediterranean Shellstone Red for floors, stairs and lift landings. This stone is found in a special layer in the quarry where only this intense color, structure and texture occur. The stone gets its Mediterranean appearance through the surface treatment. After applying epoxy resin fillings the surface is brushed and honed. Interior designer Jan Wichers is responsible for the elegant, modern design of the hotel. His film about the interior fit out process shows the dimensions and unique location of this lighthouse project on the island of Föhr. "A project with logistical challenges: All materials were transported to the building site by ship, just-in-time despite storms, high and low tide or fog."